Quesada gigas (Olivier, 1790) Is a cicada found in the United States (Texas), Argentina, Belize, Bolivia, Brazil, Colombia, Costa Rica, Ecuador, Guatemala, Guyana, Mexico, Panama, Paraguay, Peru, Tobago, Trinidad, and Venezuela. It is the largest cicada in these locations. Visit this page to listen to their song. Quesada gigas was formerly known as Tympanoterpes gigas. The image says Tympanoterpes gigas but its newest name is Quesada gigas. Stal treated this species as a synonym of T. grossa, Fabr. The type of the Fabrician species, however, is in the Banksian collection contained in the British Museum, and is very distinct, the opercula being large and rounded. The figure given in the Encyclopedic Methodique is, like Stal’s, useless for any practical purpose. Among the habitats of this wide-ranging species is that given by Walker 2, ” West coast of America,” which, as before remarked in connexion with other species, seems clearly to refer to Central America. The forms inhabiting this region (of which a Guatemalan specimen is figured) appear to be somewhat smaller than more southern specimens, or do not exhibit the gigantic specimens which are frequently and commonly received from the southern portion of the Neotropical Region. Species name information comes from Allen Sanborn’s Catalogue of the Cicadoidea (Hemiptera: Auchenorrhyncha). Q is for Quesada gigas. The Quesada gigas, aka Giant Cicada, is a giant cicada with giant range, spanning South, Central and North America, reaching as far north as Texas. Read more about the Quesada gigas. Have you ever wondered what cicadas look like or sound like in Paraguay? The Fauna Paraguayan website has many photos and sound files of Paraguayan cicadas. Wenilton Luís Daltro posted some interesting cicada items on the message board, and I wanted to post them on the homepage as well. Text PDF about brazilian cicadas, with photos. The giant cicada, Quesada gigas, has returned to Texas after 50 years! Thanks to Roy Troutman and Mike Quinn. 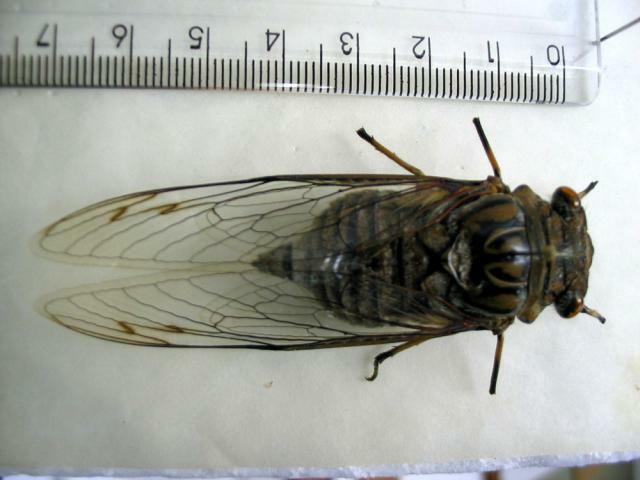 A large photo of the Giant Cicada (Quesada gigas).